Tintinaite: Mineral information, data and localities. May contain minor Fe replacing Cu. 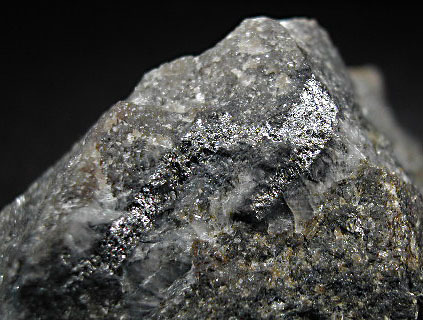 Named after its discovery locality, the Tintina silver mines, Yukon Territory, Canada. The antimony analogue of kobellite. Compare the chemically similar jaskólskiite. Kobellite 3 photos of Tintinaite associated with Kobellite on mindat.org. Quartz 1 photo of Tintinaite associated with Quartz on mindat.org. Pillaite 1 photo of Tintinaite associated with Pillaite on mindat.org. HARRIS, D.C., JAMBOR, J.L., LACHANCE, G.R. & THORPE, R.I. (1968): Tintinaite, the antimony analogue of kobellite. Canadian Mineralogist 9, 371-382. MOËLO, Y., JAMBOR, J.L. & HARRIS, D.C. (1984): Tintinaïte et sulfosels associés de Tintina (Yukon): Tintinaïte et sulfosels associés de Tintina (Yukon): la cristallochimie de la série de la kobellite. Canadian Mineralogist 22, 219-226. Zakrzewski, M. A., Makovicky, E. (1986): Izoklakeite from Vena, Sweden, and the kobellite homologous series. Canadian Mineralogist, 24, 7-18. Moëlo, Y., Roger, G., Maurel-Palacin, D., Marcoux, E., Laroussi, A. (1995): Chemistry of some Pb-(Cu,Fe)-(Sb,Bi) sulfosalts from France and Portugal. Implications for the crystal chemistry of lead sulfosalts in the Cu-poor part of the Pb2S2-Cu2S-Sb2S3-Bi2S3 system. Mineralogy and Petrology, 53, 229-250. HARRIS, D.C., JAMBOR, J.L., LACHANCE, G.R. 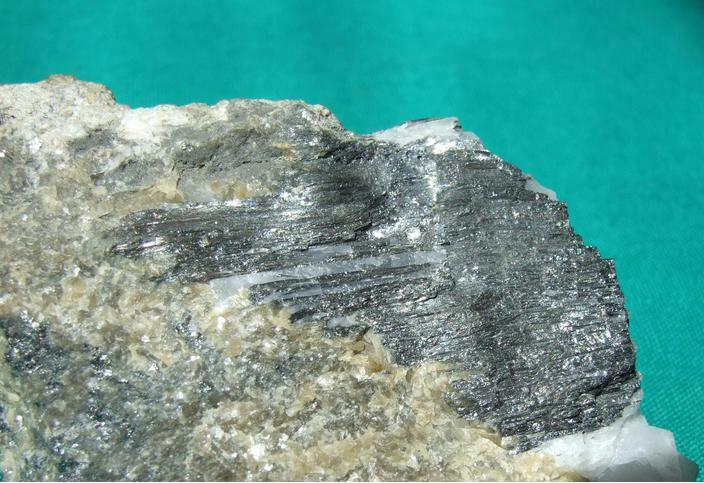 & THORPE, R.I. (1968): Tintinaite, the antimony analogue of kobellite. Canadian Mineralogist 9, 371-382. MOËLO, Y., JAMBOR, J.L. & HARRIS, D.C. (1984): Tintinaïte et sulfosels associés de Tintina (Yukon): la cristallochimie de la série de la kobellite. Canadian Mineralogist 22, 219-226. Sejkora, J., Litochleb, J., Zemek, V.: Příspěvek k chemickému složení rudních minerálů jižní části kutnohorského rudního revíru. Bulletin Mineralogicko-petrografického oddělení Národního muzea v Praze, 2002, roč. 10, s. 283-289. Orlandi P., 2003. Buca della Vena: i solfosali aciculari di piombo e antimonio (Alpi Apuane, Toscana, Italia). Riv. Miner. Ital., 4: 224-229. Enjoji et al (1983) Ganseki-Koubutsu-Koshogaku Zasshi, 78, 137-138. Klimko, T., Chovan, M., Huraiová M. (2009): Hydrotermálna mineralizácia na antimonitových žilách Spišsko-gemerského rudohoria. Miner. Slov., 41, 2, 115-132. - Pršek, J. (2008): Chemické zloženie a kryštalochémia Bi sulfosolí z hydrotermálnych mineralizícií kryštalinika Západných Karpát. Univerzita Komenského, 108 p.
Chovan, M., Majzlan, J., Ragan, M., Siman, P., Krištín, J. 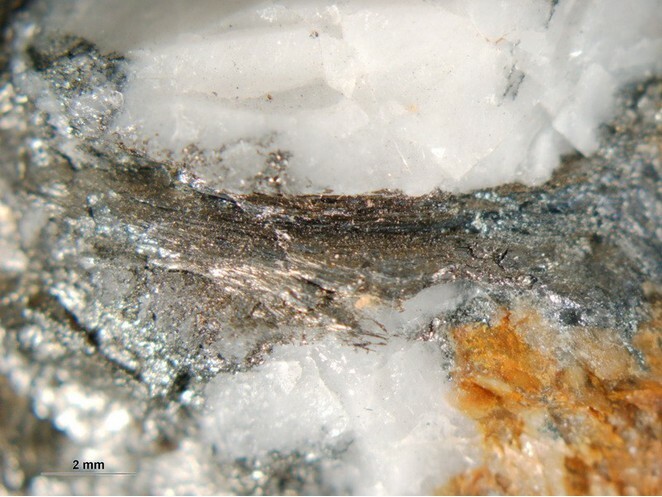 (1998): Pb-Sb and Pb-Sb-Bi sulfosalts and associated sulphides from Dúbrava antimony deposit, Nízké Tatry Mts. Acta Geologica Universitatis Comenianae, 53, 37-49. Mikuš, T., Kondela, J., Jacko, S., & Milovská, S. (2018). Garavellite and associated sulphosalts from the Strieborná vein in the Rožňava ore field (Western Carpathians). Geologica Carpathica, 69(3), 221-236.